Lying just 15 minutes from Durban CBD, the beautiful, much sought after leafy-green KwaZulu Natal suburb of Westville is the first western borough of "Greater Durban". Westville was named after Sir Martin West, Lieutenant-Governor of Natal in the mid-19th Century, whose farm was later transformed into the up-market KZN Westville residential area, which has recently become a thriving business centre, with prestigious office parks springing up and attracting major companies and professional firms to Westville. Right in the middle of the 'country-like' atmosphere of Westville, nature lovers and the outdoor adventurer are catered for, as the Westville Palmiet Nature Reserve spans the length of Westville valley, and has numerous trails which lead hikers to various interesting sites, which include waterfalls, cliffs, a grassy mountain ridge and picnic sites. 200 years ago the Westville Palmiet Nature Reserve was known as a wild and untamed place, full of giant 20 foot (6m) pythons, leopards and lions. Back then it was cultivated with bananas, pineapples, mangoes and pawpaws, and teeming with kingfishers and owls. Many of the same types of birds still circle the sky over this tranquil Westville valley, making this Westville nature reserve a bird watchers paradise. 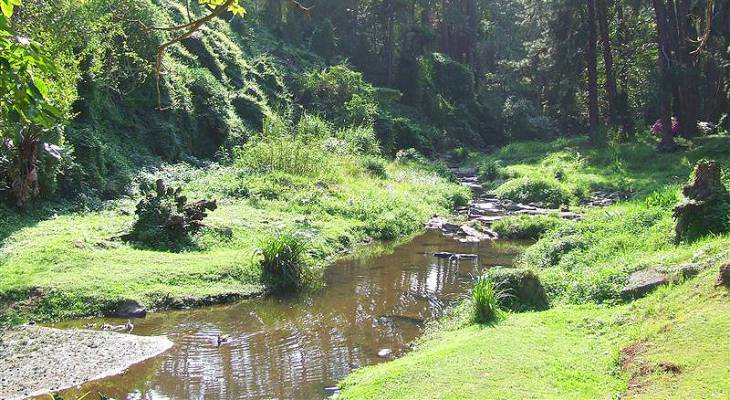 Today, the Westville Palmiet Nature Reserve lying In the midst of the bustling KwaZulu Natal suburb of Westville remains as mysterious as it was, (sans the exotic wildlife) - a peaceful, quiet place with a meandering river running through it. Lying near Westville "Spaghetti Junction" (3-Level freeway interchange) is the stylish Westville Pavilion Shopping Centre, which draws shoppers from all over KZN and beyond. The Westville 'Pav', as it's fondly known, offers over 40 restaurants, cinemas, a banking mall with Forex facilities, supermarkets, plenty of fashion outlets, and stores stocked with sports equipment, electronics, décor, music, books, and much more. Whatever you forgot to bring on your trip to Westville - they've got it. For those who want more shopping, in the Highway area. there's Westwood Shopping Mall situated on the edge of Westville, boasting a variety of new and exciting stores, as well as two smaller centres in the heart of Westville - Westville Mall and Westville Village Market - home to Westville Virgin Active. Westville is also known as an excellent academic centre, boasting its own university at the Westville Campus of the University of KwaZulu-Natal, which provides a high standard of education and training. In the inviting setting of the long-established Westville community, this KwaZulu Natal tertiary institution is a natural progression for students graduating from Westville Boys High School and Westville Girls High School - schools that have served Westville's educational needs for the past 60 years. Umkhumbane Market - a delightful Sunday excursion with a variety of musicians and dancers adding to the vibe. Westville Bergtheil Museum is located in the oldest building in Westville, and dates back to the 1840's. Westville Country Club offers a wide variety of social, dining and sporting activities. Westville Theatre Club - provides entertainment for club members, family, friends and the public. Westville Swimming Pool - a favourite gathering place for both adults and children during summer. Westville Athletic Club - one of the most successful, respected and recognisable clubs in the country. Westville lies just 32km on the N2 from Amanzimtoti, an easy 23 minutes south to the start of the KZN South Coast, and 27km on the N2 north to Umhlanga Rocks (or take the M4 along Durban beachfront) on the KZN North Coast route. Drive north via the N3 from Westville for about 50 minutes to Pietermaritzburg, the start of the KZN Midlands & Battlefields, from where you have easy access to the Drakensberg. Westville never experiences weather of extreme lows or highs. The Westville Winter is around a mild 22°, and Summer a balmy 30° - the ideal environment which escapes the extreme heat of the Durban CBD Summers, and the much colder Upper Highway Winter temperatures. We were accommodated at Ntengu Lodge, the most exquisite Guest House in Westville. Ntengu Lodge is a 5 star luxury guest house perched on the edge of a ravine on the Westville Palmiet Nature Reserve - a peaceful, quiet place teeming with abundant bird life, and a meandering river running through it. In the middle of the busy Westville suburb, we felt like we were on Safari, enjoying stunning views of the Westville Palmiet Nature Reserve from the deck while we sipped cocktails at days end. Our Ntengu Lodge hosts happily filled us in on the history of Westville. Not only has it become a thriving business center, but it also sports the University of KwaZulu-Natal. Then there's the fact that Westville accommodation is on the route of the world-famous Comrades Marathon, which takes place annually between Durban and Pietermaritzburg - Bed and Breakfasts in Westville are very popular during this time, and should be booked way in advance. Westville Self Catering accommodation will be just as popular. Just minutes away lies the Westville Pavilion Shopping Center, where the girls took the opportunity to shop and eat a sumptuous meal in one of the 40 restaurants on offer, while the guys escaped to the nearby Westville Driving Range. On a day off, we took the opportunity to drive to the Durban beach-front, although once there, we were in no hurry to stay, preferring to head North to quaint places like Hillcrest, Botha's Hill and Drummond. Discovering Westville and the surrounding areas was an unexpected delight, and I plan to return to Westville, only this time I may look at renting a Self Catering unit, and bring the whole family with. Thank you Andrew and the team at Ntengu Lodge, and special thanks to 'the barefoot chef' for the scrumptious treats. Westville overview. Westville Accommodation and Information.